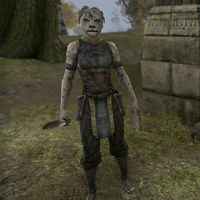 Azartah is a Khajiit merchant who can be found in Cropsford. "Azartah exists to serve. How may I help?" "Azartah is pleased with it. Trade is good, with much commerce between here, Alessia, and Drakelowe. Azartah was wise to find such a fragrant locale, yes?" So you plan to stay here? "Perhaps. The Goblins are a concern. I smell more of them nearby every year. We shall see how the village prospers. But in business, the wise do not talk of their plans, no?" This page was last modified on 20 January 2019, at 10:42.